Washington has been arming Bahrain’s ruling dynasty against protesters, and now demanding that the “dictator must go” in Syria. Why such a difference? 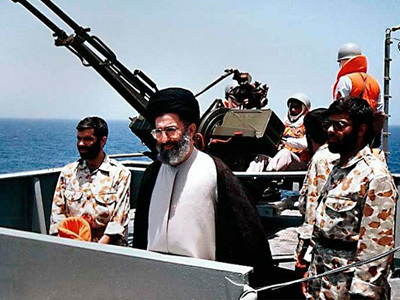 Right – Bahrain hosts the US' Fifth Fleet, the “free world” defender crucial in containing Iran. ­Lessons in democracy require extra homework when taught by the West. They insist that the Syrian "dictator" step down from his post, while experts say the violent opposition receives not-so-humanitarian aid from the West to achieve its goals. Last year, human rights groups and members of Congress forced the Obama administration to suspend an arms deal with Bahrain. But this time around, there’s a legal loophole that can be used to avoid Congressional approval. Rallies ahead of the first anniversary of anti-Khalifa protests were violent enough to be stopped with military means – but not violent enough to get Western media attention. 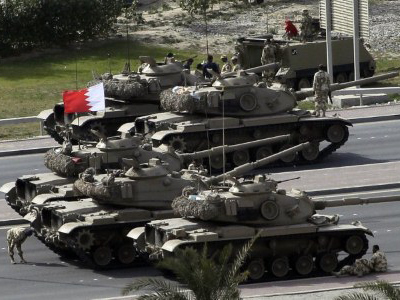 There are fears that US arms are mishandled in Bahrain, which is bad news for a strategically important country where the US keeps its Fifth Fleet. “Rarely we have media coverage, it’s not just the Gulf states or Bahrain in particular, it is also countries like Yemen, whose brutal dictatorial former president is currently in the United States receiving medical treatment, and no reporting is taking place from Yemen. Demonstrations in Saudi Arabia a few days ago [also] got very little coverage,” Middle East expert Tariq Ali told RT. Saudi Arabia – who helped Bahrain's ruling family stop the violence a year ago – is now actively backing rebels against the Syrian regime. “Acting as a surrogate of the US in the region,” Ali notes. 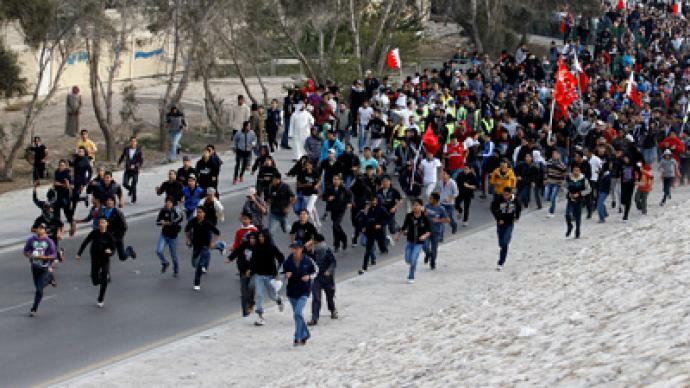 It seems like nothing more than a minor problem for the West, however, that the Shiites who make up the majority of Bahrain's population have forever lacked representation under the 200-year rule of the Sunni dynasty. 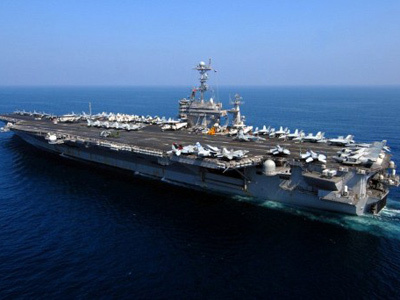 But this is too small of a reason to lessen the pressure on Iran brought by keeping the Fifth Fleet in Bahrain. In March 2011, Bahraini King Hamad bin Isa al-Khalifa asked NATO's Gulf Cooperation Council to help “protect” his country, claiming that Iran was backing his country’s opposition. 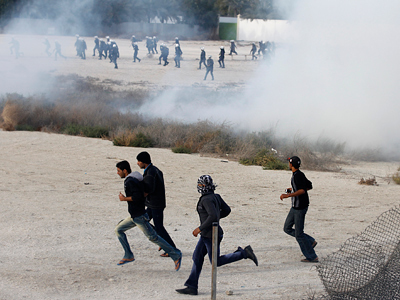 More clashes with riot police marked the Bahraini opposition movement's one year anniversary. After rallies ahead of the date, police were determined to prevent opposition members from reaching the Pearl roundabout, a significant landmark for the movement. According to various reports, there were many injuries and arrests. It seems that many dictatorships are kept afloat as long as they can be of use. For example, “one of the most undemocratic countries in world, Saudi Arabia, is oil-rich and obedient to the West – which happens to be highly dependent on its natural resources,” Ali says. But in the end, all of those oil-rich countries share a common goal with their Big Brother: Saudi Arabia said it would go nuclear if Iran creates an atomic bomb. Together with Qatar, the Saudis are the key American allies in the region. ­The statements, views and opinions expressed in the story are solely those of the author and do not necessarily represent those of RT.